What an honor to photograph the very first wedding held at The Lido House Hotel. This boutique hotel is the perfect venue for a Southern California wedding. This photo was taken just after the bride put her gown on. We headed up to the second floor of the Balboa Cottage to find this great mid century hanging chair. The bride couldn't be more stunning as I photographed her. 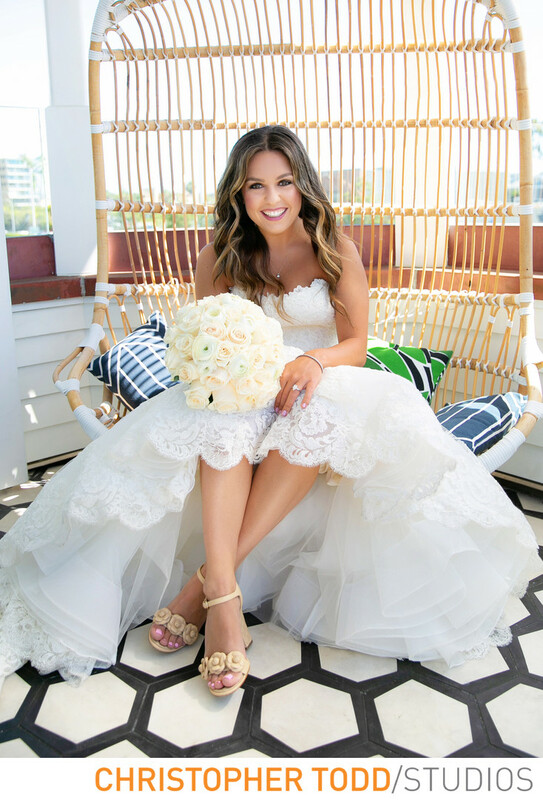 The bride began the day getting ready in the Balboa Cottage. One of five custom cottages at the hotel. The beautifully designed cottages feature a rooftop terrace, a sunlit kitchen with a lounge-inspired breakfast nook, a first-floor powder room, two bedrooms and two bathrooms on the second level. A perfect place to spend time with your bridesmaids and special women in your life before you walk down the aisle. Although ceremonies are held on the Lido Lawn Kaylin & Brendon had a beautiful ceremony at Saint James Episcopal Church just up the way from the hotel. After a fine cocktail hour on the lawn the guests headed into the Boathouse Ballroom where the couple made their grand entrance as husband and wife. Followed by the first dance. Location: 3300 Newport Blvd, Newport Beach, CA 92663. 1/400; f/2.8; ISO 125; 28.0 mm.